(0 Customer Reviews) | Write Review 6 issues per year If you’re looking for fast, timely, expert advice on the franchise industry – look no further. Your favourite source for hot topics in franchising is now available wherever you go. If you’re looking for a franchise or have questions concerning the industry, Business Franchise is the magazine for you. Produced by CGB Publishing, our Australian/New Zealand publication has a wealth of experience behind it. Business Franchise magazine is an industry leader, giving you comprehensive information on the franchising industry. Each top quality magazine highlights selected franchise systems and explores the benefits specific to their particular brand. Our magazine knows timely, professional advice is crucial to making smart business decisions. As such, we present our Expert Advice articles, written by industry leaders in franchise banking, accounting, legal, insurance and consulting. We dig deeper with ‘Franchisee in Action’ articles – highlighting a particular franchisee and relating their real life experiences within the industry. ‘Franchisor in Depth’ looks at the other end of the spectrum, focusing on a particular franchisor. If you’re looking for fast, timely, expert advice on the franchise industry – look no further. Add to this our contribution from the Franchise Council of Australia and Franchise Association of New Zealand along with A-Z listings of available franchises and you need look no further for what’s happening in franchising. 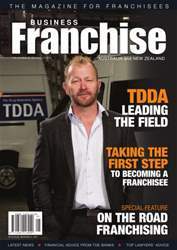 You'll receive 6 issues during a 1 year Business Franchise Australia&NZ magazine subscription. You'll receive 6 issues during a 1 year Business Franchise Australia&NZ magazine print subscription.